Under Oaks is a series That came about from living in an oak forest here in Topanga. 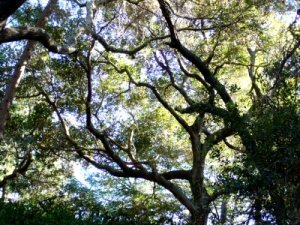 Our property is host to at least 80 imposing Coast Live Oaks (and they host us). 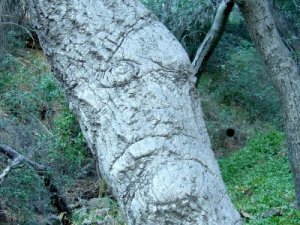 The Chumash, I heard, called them “los dedos del diablo.” After living here awhile you begin to understand why Quercus agrifolia are indeed the fingers of the devil. They are unpredictable. Their trunks and branches meander in suggestive and monstrous ways. They seem to anchor the cold to the ground and in summer create doldrums that block the ocean breeze. They come crashing to the ground without notice and sprout apparently without discrimination. Black trunks and branches and in the rain even blacker. The foliage looks gray at first, then green high up with little patches of blue sky, sometimes it’s hard to tell if they’re even alive. The branches twist and wander and arrange themselves into fantastic, alternately benevolent or wrathful figures, a horse, a weird frog, some kind of segmented insect, an arabesque…. The bark is rough and thick, scarred by long life and painful decisions. Every tree proclaims a hidden life of its own. I work in the same way as the forest; preparing the paper, building the crystalline structure, inventing the black and golden body that twists and meanders over ley lines in the paper. Sometimes a geometric shape, a bed, a carpet, is found, aligned with a constellation. A place to get your heading. Then come the leaves and branches, those I grow like the leaves and branches of the Quercus agrifolia: both by chance and exploitation of opportunity. After each layer of Splattobscurro (which allows a cetain degree of chance) I exploit what chance has presented. The process is additive, color on color. Because of the way this technique is applied the figures that result follow what appear to be predetermined pathways. Like the oaks themselves the paintings evoke sun and shade through branches that twist and wander and suggest the life that grows from an ancient golden core.